The Harvard Medical School (HMS) Quad Reorganization project involves the relocation of the Microbiology Department and its merger with the Immunobiology Division faculty. The 60,500 square foot renovation of the 10th floor in the Harvard Institutes of Medicine (HIM) and the 8th, 9th and 10th floors in the New Research Building (NRB) was carried out under two packages (phases) over a two and one-half year period. In setting the sustainability goals to guide the project’s design and operation, the project team utilized the Harvard University Green Building Standards for Fit-outs and the LEED-CI v2009 Certification requirements. The main sustainability goals for the project include the following. 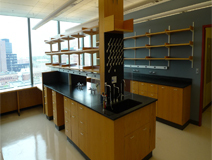 Resource conservation through the reuse of as much of the interior non-structural components as possible, including finish materials and existing lab benches. Lighting design reduced energy demand through careful selection of fixtures and lamps, as well as the strategic use of occupancy sensors. Materials selection focused on regionally manufactured items, maximizing recycled content, and choosing products with little or no potentially harmful chemical compounds traditionally found in some building materials. Enhanced commissioning services were used to ensure that energy use and air quality goals were met and maintained.